How To Fill AIIMS Application Form 2019: AIIMS MBBS exam is conducted every year for admission to MBBS course in the seven campuses of AIIMS. 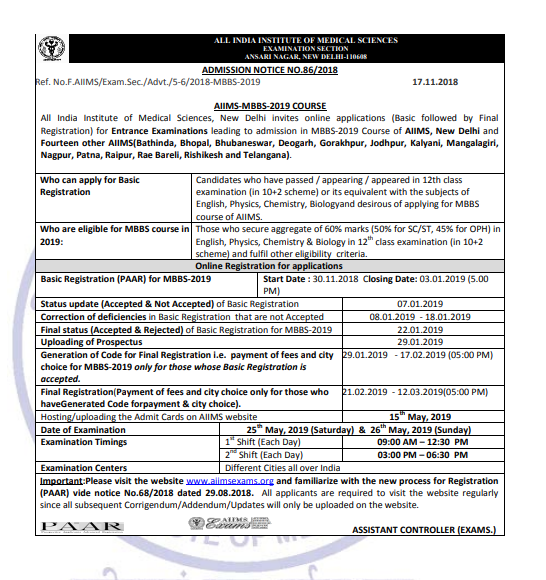 All India Institute of Medical Sciences has released notification for AIIMS 2019 MBBS admission. 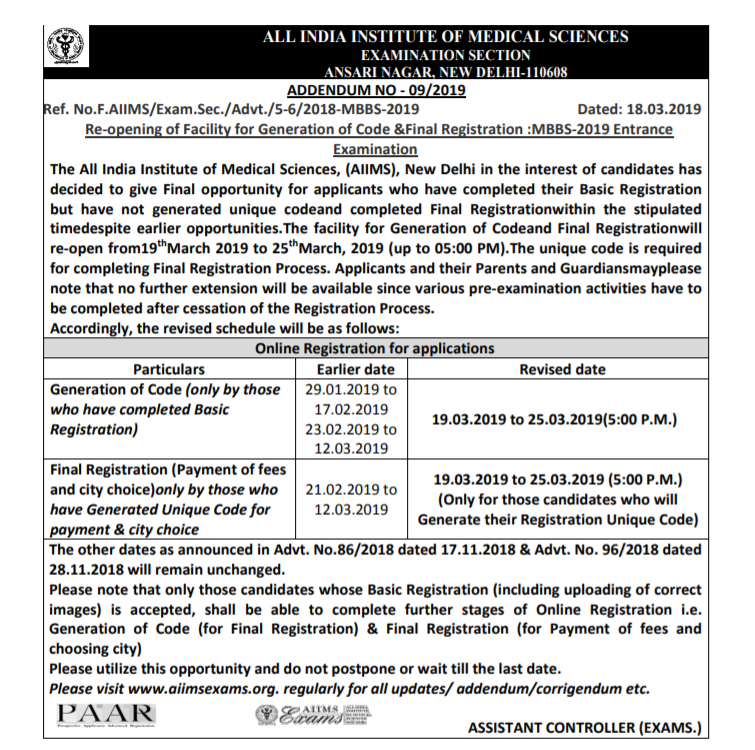 AIIMS 2019 Application Form can be filled from November 30, 2018, and the last date for final registration is from 19th March to 25th March 2019. AIIMS MBBS 2019 entrance exam will be held on 25 and 26 May 2019. The online registration for AIIMS 2019 will be open till 14th January 2019 and this year board officials of AIIMS has introduced PAAR facility for the students who are registering through online. So this year AIIMS registration process will be done in two parts that are Basic Registration and Final Registration. In Basic registration, students will have to fill their basic details and upload their photograph whereas in the Final registration students will have to choose the exam center to complete the application form and make the fee payment. Candidates must thoroughly go through the AIIMS notification, ensure they fulfill the AIIMS eligibility criteria, and read the requirements to fill up the AIIMS application form before applying. In this article, we will give detailed information about AIIMS application form 2019. The All India Institute of Medical Sciences, (AIIMS), New Delhi in the interest of candidates has decided to give another opportunity for applicants who have completed Basic Registration but have not generated unique code till date. The facility for Generation of Code will re-open from 19th March to 25th March 2019 (up to 05:00 PM). No further opportunity will be available & hence all applicants are requested to use this facility. Enter the login credentials – registration ID, password and provided captcha code. Click on the ‘Generate Code’ option displayed on the left side of the screen. Using the option, candidates then have to select their course, in which they are applying. Now the AIIMS MBBS application form code along with basic registration ID and candidate’s name will appear on the screen. Students are advised to take a printout of the generated code for AIIMS final registration process and further references. Nationality: Indian Citizen, Overseas Citizen of India (OCI) and Foreign Nationals. Age: The minimum age should be 17 years as on 31st December 2019. Educational Qualification: Candidates should have passed Class 12 exams from CBSE, ICSC or any other equivalent board with English, Physics, Chemistry, and Biology as subjects. Those who are appearing for the qualifying exam can also apply. Qualifying Marks: Candidates must score minimum aggregate marks of 60 percent in Physics, Chemistry, Biology, and English (50% for SC/ST/OPH/OCI candidates) in the qualifying exam. 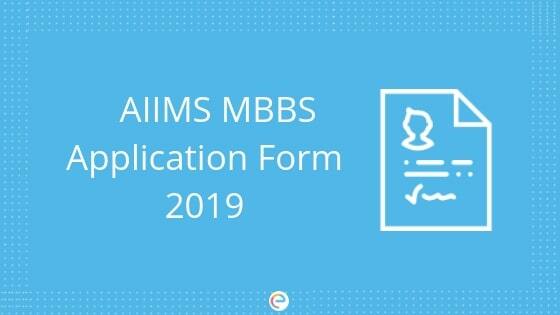 How To Fill AIIMS MBBS Application Form 2019? Step 2: Click on the tab Academic Courses and select MBBS. Step 3: Now read the instructions and click on Proceed. 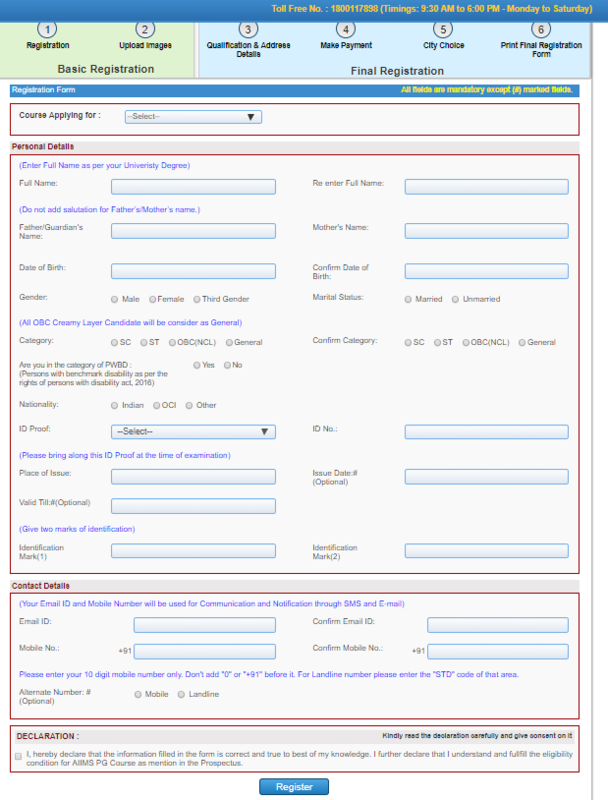 Step 4: AIIMS application form will be displayed and students are requested to enter the necessary details. Step 5: After filling the details, click on the register button. Now you will receive your credentials through E-mail or SMS. Step 6: Now click on “Proceed for Step 2“. Step 7: Upload scanned images of your latest passport size photograph, signature, and left thumb impression. Step 8: After basic registration is accepted, candidates can proceed to final registration. Step 1: Login with the help of your credentials and click on the AIIMS MBBS Application Form 2019. Step 4: Choose your preferred city for the exam center. Step 5: Make payment of AIIMS application form fee. Payment can be made by using credit/debit card or Internet Banking. Step 6: Click on “ Proceed” and your registration acknowledgment will be displayed on the screen. Step 7: Now Take a print out of your AIIMS application form for future reference. Important: Candidates must ensure the scanned images of Photograph, Signature, and Left Thumb Impression have the same size and format as mentioned in the AIIMS Prospectus. What to do if I forgot my Password or Candidate ID? In case if aspirants forgot their candidate ID, they can get it from the mail sent by the authority. If they cannot find the same, they need to enter the registered email ID and mobile number to get the same send through SMS and mail. Step 1: Login to the AIIMS official portal. Step 2: Your AIIMS application form status will be displayed. Step 3: The officials will mention the details in red color which has to be edited. Step 5: Now take the print out of corrected application for further reference. Candidates must upload documents adhering to given specifications. There is negative marking in AIIMS. For each wrong answer, 1/3rd of the mark allotted to the question will be deducted. There is, however, no penalty for questions not answered. The total time duration for the exam is 3.5 hours. Q1. Has AIIMS 2019 registration started? A: Yes, AIIMS 2019 registration has been started and the last date for filling the AIIMS Application Form that is final registration is on March 12th. Q2. How can I get AIIMS 2019 Application Form? Step 1: Visit the official website of AIIMS: aiimsexams.org. Q3. When AIIMs Form Will Come? A: AIIMS 2019 Application Form can be filled from November 30, 2018, and the last date for final registration is from 21st February to 12th March 2019. AIIMS MBBS 2019 entrance exam will be held on 25 and 26 May 2019. Q4. How many attempts are allowed in AIIMS? A: There is no limit to the number of attempts in AIIMS. Candidates can give AIIMS Exam until 30 years of age. Q5. How can I get admission in AIIMS? A: Candidates who wish to secure admission in AIIMS must visit the official website and successfully apply for AIIMS exam. After registering themselves, candidates must appear for the AIIMS exam and obtain the qualifying marks to secure an admission in AIIMS college. Q6. What is the fees for AIIMS? Q7. Does AIIMS offer BAMS? A: All AIIMS offer MBBS and BSc nursing (only for girls) course & 2 paramedical courses related to dental also offered by AIIMS Delhi. Q8. Does AIIMS have NRI quota? A: Yes, 100 seats for Indian Nationals and 7 seats for Foreign National are available for admission to MBBS course in AIIMS New Delhi. Q9. How many seats are available in AIIMS for MBBS? A: A total of 1200 seats are available in AIIMS MBBS. Q10. How many AIIMS are there? A: There are a total of 8 AIIMs functioning hospitals. Candidates must take AIIMS mock tests regularly and work on their weak chapters and concepts. And with Embibe’s personalized analysis of your tests, your score will definitely improve from one test to another. Also, you can use Embibe’s AIIMS study material to understand the concepts that are not clear to you. You can solve unlimited AIIMS practice questions as well on Embibe. We hope this detailed article on AIIMS application form 2019 helps you. If you have any query regarding AIIMS application form 2019 or the exam in general, feel free to post it in the comment section below. We will get back to you.